Since the 2016 EU referendum, there has been much discussion of whether the UK party system is set to realign around the issue of the EU, just as the Scottish party system has around the issue of independence. The release of the British Election Study wave 10 data gives us an initial view of how voters are reacting to the new political environment and where they are moving to. 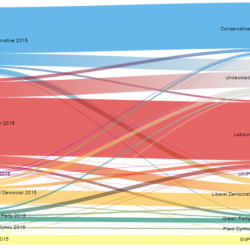 To look at possible realignments we show how Leave and Remain voters have shifted in their party preferences between 2015 and wave 10 conducted late last year. First, there has been a great deal of movement in vote intentions since 2015 amongst both Remainers and Leavers. In Wave 10 only 56% of Remainers and 56% of Leavers said they would vote for the same party as they voted for in 2015. The Remain side is much more fragmented than the Leave side, where the Conservatives have the largest chunk of the vote. Second, there are a large number of undecided voters – the “don’t knows” constitute the third largest “party” for both Remain and Leave voters. Third, a sizeable chunk of UKIP voters have defected to the Conservatives. Since leaving Europe is now official Conservative party policy, some voters may being seeing less of a need for a separate party devoted just to that issues. Fourth, 2015 Labour voters have been defecting in high numbers on both the Remain and Leave sides. Labour’s best move here is tricky. While Labour leave supporters have been more likely to leave Labour than Remain supporters, Labour also started with more Remain voters to begin with. The net result is that Labour is losing a fairly similar absolute number of Remain and Leave voters. Fifth, the scale of a Liberal Democrat revival from Remain voters is fairly small at the time of wave 10, only 10% of Labour Remain voters and 8% of Conservative Remain voters had defected to the Liberal Democrats. Finally, there are also some indications that the SNP vote may be splitting along EU referendum lines. They only managed to retain 55% of their 2015 voters who supported Leave compared with 83% of their voters who supported Remain. So is British politics realigning? The EU referendum has certainly stirred voters up even more than would be expected in the volatile modern electoral environment. The Conservatives do look set to become the dominant party of Leave voters, but there is no one party that is currently consolidating Remain voters. Whether this merely reflects the popularity of Theresa May compared with Jeremy Corbyn’s lukewarm (at best) support or a permanent shift in British party politics remains to be seen.